It took more than a century to build La Real Maestranza of Seville, the oldest and one of the most significant bullrings of Spain. The construction began in 1761, on the remains of its predecessor; a square plaza made of wood raised from the floor of the Baratillo hill and near the Arenal. 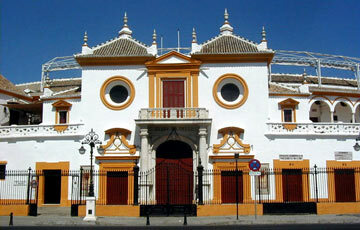 Various architecs intervened with its building, until it was finished in 1881, by Juan Talavera de la Vega. The architect Aníbal González gave this own personal touch to the stalls in 1914 and in 1928 he completed the annexe house to the bullring , which is now the central office of the society of the Maestranza. Amongst all the architectural and sculptural work of the bullring, we should pay special attention to the Prince´s Balcony (1765) that is the work of the portuguese Cayento de Acosta. Underneath is the Prince´s Door, which is closed by a beautiful iron gate, the work of Pedro Roldán.To walk through this door is the most desired achievement of all the bullfighting figures. Under the tiered seats of the bullring is the Bullfighting Museum and to visit is the best from of getting to know the history of this national festival.